New York, New York, U.S. - This morning vandals redecorated the facade of the Mexican Consulate with slogans in memory of slain New York anarchist journalist and activist Brad Will and in support of the anti-government struggle in the state of Oaxaca, Mexico. 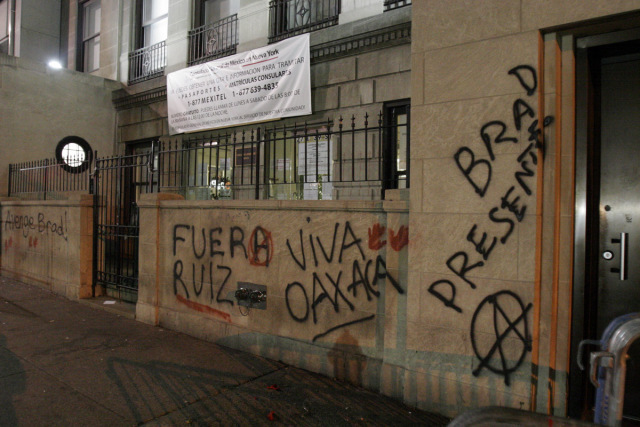 The slogans "VIVA OAXACA," "BRAD PRESENTE," "Viva Brad," red hand prints, a circle "a" anarchy symbol, and others where left on the walls outside the building. The Mexican federal government used the assassination of Will as an excuse to send a large force of federal riot police into Oaxaca City to put down protests against Governor Ruiz. The troops have since left the city. December 22nd is an international day of solidarity with the people's struggle in Oxaca. A rally was planned to take place at the New York consulate later in the day. Demonstrations were also held in Tel Aviv, Israel and Mexico City.